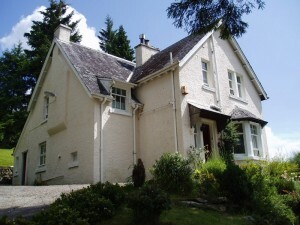 Glengarry House – B&B and Self Catering accommodation on the West Highland Way, Tyndrum. Glengarry House is a friendly and comfortable Guest House situated between Crianlarich and Tyndrum where Loch Lomond, the Trossachs National Park and the breathtaking Scottish Highlands meet. Tyndrum is on the A82, the road North to Oban and Fort William. There are excellent facilities in the village including pub, restaurant, fish and chips cafe, petrol station, mini market, cash machines and two railway stations. We are centrally located which makes Glengarry ideally situated for hiking, munros, cycle touring, canoeing, mountain biking, golfing and walking the West Highland Way (WHW). It is also an excellent base for touring by car or motorcycle. In addition to the B&B we have a separate self-catered lodge at the back of the house with panoramic views to the west. There are 20 munros within ten miles of the house, 4 of which you can do from the front door. This makes Glengarry and the Lodge an ideal place for bagging munros in this part of the country.